Some local women have teamed up to form a new organization in Peoria called CHANGE – G.M.O. (Choosing Honest Accomplishments Noticing Greatness Eternally – Girls Matter Organization). 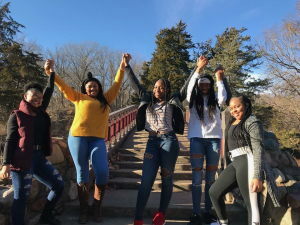 Founded by Towanna Wyatt and Co-Founder Tammika Evans Faulkner the mission of the organization is to help young girls ages 11 -17 embrace confidence, respect, and character with a vision to empower them along the way. “Forty years ago, growing up in Peoria as a child, was something fun. Childhood was great, schools cared and police were friendly. Having fun was a given. Today in our community, I see our children lacking respect in all areas for themselves and for others. Teachers seem to be doing more time disciplining than they are teaching. And most of our police seem to be stereotyping children more than ever now. Realizing I have a daughter that is growing up in today’s society, it scares me to allow her to even mingle in our community. With that being said gives me the joy of bringing about the organization CHANGE G.M.O,” says Towanna Wyatt, founder of Change – G.M.O. Instead of ignoring the problems our young girls are facing, Wyatt and Faulkner decided to be a part of the solution. CHANGE G.M.O. is a made up of a group of diverse women hand selected by the founders, and a host of volunteers with the will and desire to truly make a change. “We believe our resources, talent, and expertise are great tools that we are able to share and pass along to our girls, so that makes us overly excited to present CHANGE G.M.O. to our Peoria community,” says Wyatt. The first meeting was held at the Lincoln Branch Library on Sunday, January 20th. If anyone is interested in becoming a volunteer or sponsor, please contact Tammika Evans Faulkner (309) 264-4383. To learn more, visit Change – Girls Matter Organization on Facebook.